To reorder the columns, drag a column header to the left or the right. 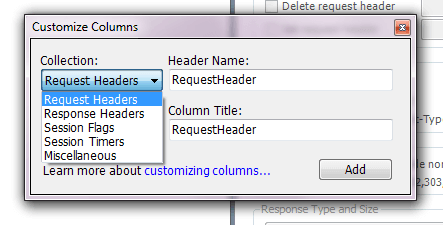 To resize a column, drag the edge of a column header. Use the Customize Columns menu. Click the Collection drop-down menu and select the collection that will populate the column. Enter the name of the collection member that will populate the column and the title of the column. Columns added using QuickExec will be removed the next time Fiddler starts. 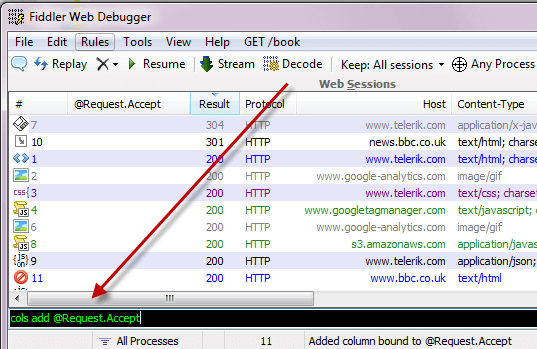 For more QuickExec column commands, see the QuickExec Reference. Call the AddBoundColumn method from an [IFiddlerExtension], passing a getColumnStringDelegate as the third parameter.